» Will Protein make me fat? 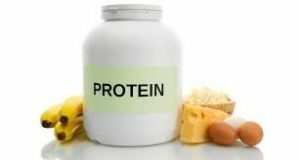 Will Protein make me fat? Seems like this question never seems to go away! One thing we need to teach our clients and peers is that NO ONE Macro Nutrient will make you fat. If we go back to the basics of calories in versus calories out take the following scenario into consideration. If John Doe has a BMR (Basal Metabolic Rate) of 2500 with Total Daily Expenditures of 500 for a total daily caloric expenditure of 3000 calories a day. Not to endorse a Snickers diet at all with what I’m about to explain, but in simple words, if John Doe would eat nothing but 3000 calories of Snickers he would not gain a single pound as it equals exactly what his body is burning. In conclusion, it is not what you eat that makes you fat. It is the over consumption of calories that puts excess weight on you. The lack of exercise, specifically resistance exercise, compounded by the overconsumption of calories is what will make you fat. For more detailed and sanctioned education, join us for our quarterly Nutrition Workshops which are Personal Trainer Continuing Education Credits sanctioned by the NFPT, NASM, ACE, NCSF, and NSCA. We count calories from proteins, carbohydrates and fats of each food or supplement. © Copyright 2014. Global Fitness Educators. All rights reserved.